The beetle family Cerambycidae, also known as long-horned beetles or longicorns, is characterized by emblematic extremely long antennae, which are usually longer than the total body length of the animal. The family is rather rich in diversity with more than 20 000 species known, distributed worldwide. Some representatives of these bizarre-shaped beetles, are also known as serious pests with their wood-feeding larvae causing extensive damage to living trees or untreated lumber. The beetles from this family are mainly associated with leaf litter habitats, where the specimens in this study were also collected. The newly discovered species, Schwarzerium yunnanum, represents a remarkably engaging representative of the family with a blue-greenish beautifully colored body, and distinctive blue legs. A new subgenus, Rugosochroma, is also erected as a result of this recent discovery. The specimens examined were found in the Yunnan Province of China, where the name of the new species is derived from The study was published in the open access journal Zookeys. Alongside the new species, seven known ones have been recorded from China for the first time. Among these are the very rare Aphrodisium tricoloripes, known only from China, Myanmar and Vietnam, as well as Chloridolum semipunctatum, so far exclusively found in Northern Laos. 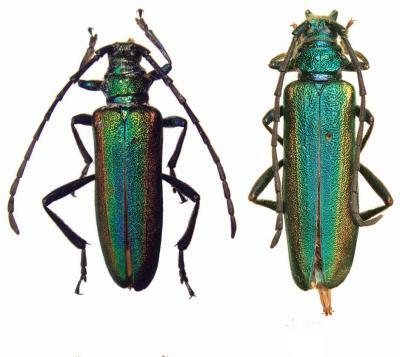 All the species described, including the new one, belong to the subfamily Cerambycinae, which includes 750 genera in total. Within the long-horned beetle family, this remarkable biodiversity can be only rivaled by a single other subfamily Lamiinae, more commonly known as flat-faced longhorns. gambled gambler gambles gamboge gambols gambrel gamelan gametal. polypi polyps pomace pomade pomelo pommee pommel pommie. twisting twitched twitcher twitches twitters twittery twitting twofolds.